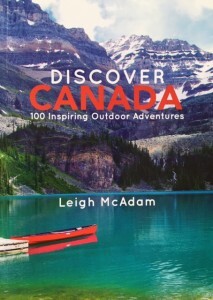 Leigh McAdam encourages people to get out and explore Canada with this guide to self-locomotion. Covering the country from coast to coast and every season she offers choices for hiking, biking, skating, rafting and paddling. Each adventure includes main attractions, time needed, cost, and guided options. This isn’t just a book for daydreaming. McAdam has selected activities and destinations that are affordable for the average traveller. Her difficulty ratings may not match your abilities so read the criteria carefully. If hiking 18 kilometers in a day sounds like more than moderate exercise, peruse the easy options. But get moving. This book will have you hankering for outdoor adventure! Discover Canada: 100 Inspiring Outdoor Adventures. Click to Tweet. Get outside and explore Canada with this guide to self-locomotion: Click to Tweet. From coast to coast @hikebiketravel has you covered with her new guide to outdoor adventure: Click to Tweet.